World language teachers often try to avoid days of direct instruction. But there is always a point in every unit when the students need that direct guidance. For each of those lessons I have created a notes presentation. Each notes file includes a PowerPoint presentation and an interactive student notes guide. I also included PDF versions of both, which would be easy to post online for students who are absent. Since many teachers try to keep direct instruction to a minimum of class time or are trying to run a flipped classroom, I tried to make each PowerPoint presentation as efficient as possible. With that in mind, the meat of the explanation is clear and concise in English. The notes include direct instruction and a few examples to practice, but they do not include games and interpersonal activities – that is intentional so that flipped classrooms can keep the instruction self-guided without class activities. 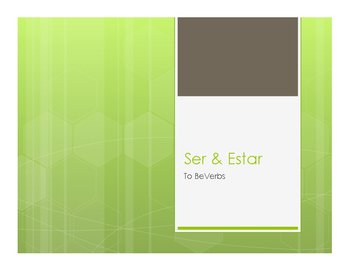 This activity reviews advanced uses of ser vs estar. 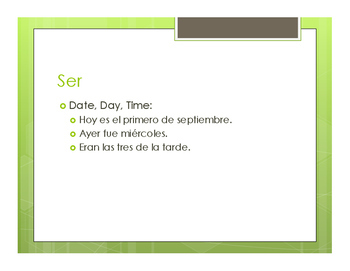 It uses present, preterite, imperfect, future, and conditional tenses. 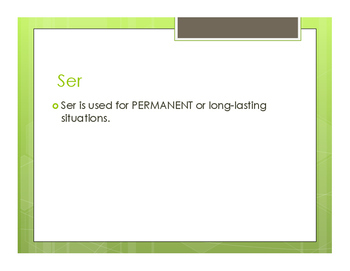 It references ser for passive voice, estar with present progressive, and ser for locations of events. 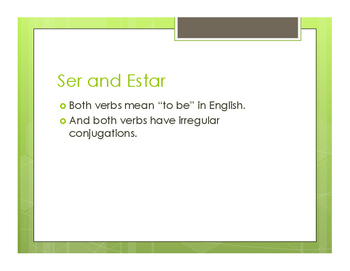 It goes into meaning changers like estar/ser listo, estar/ser aburrido, etc. My notes are no prep - just print the guide sheet and go! These notes primarily focus on the ACTFL language comparison standard. Going paperless? Use the PDF version of this product in the Notability app for students to add their notes. Or upload the editable version into Google docs to access on a Chromebook. By purchasing this product you agree to the applicable license terms set forth by teacherspayteachers.com at the time of purchase as well as to the terms of this agreement. Upon purchase of this product, The Profe Store LLC, grants the purchaser of this digital download one perpetual, non-exclusive, non-transferable license to modify, and to print paper copies of this product. By purchasing this digital download, you agree that the digital download contains proprietary information and material that is owned by The Profe Store LLC and/or its licensors, and that this information is protected by applicable intellectual property laws, including but not limited to copyright law. Reselling, renting, leasing, loaning, distributing, or otherwise transferring any modified or unmodified version of this product is strictly prohibited. By purchasing this digital download, you also agree that you will not use such proprietary information or materials in any way whatsoever except as permitted by this license or law.